Thomson was born in Cheetham Hill, Manchester, England, on December 18, 1856. He was the son of a bookseller who specialized in antique books. At the age of 14, he enrolled at Owen's College (now the University of Manchester). Thomson's original plans to study engineering were interrupted two years later when his father died and the family was no longer able to afford the additional fees needed for his engineering studies. Instead, Thomson decided to major in mathematics and the physical sciences. In 1876, he earned a scholarship at Trinity College, Cambridge, and graduated second in his mathematics class four years later. Thomson remained at Cambridge in various positions for the rest of his life. The discovery for which Thomson is best known is that of the electron. The research leading to that discovery had two different origins. The first involved atomic theory. A popular view of the atom in the 1880s was that it consisted of vortex rings, structures similar to smoke rings. In 1883, Thomson wrote an essay on this theory that won the Adams Prize. A second line of research involved the study of cathode rays, first discovered by William Crookes in the 1870s. Some scientists believed that cathode rays consisted of a stream of negatively charged particles. But efforts to deflect the rays with an electrical field--an observation necessary to support this view--had been unsuccessful. In 1897, Thomson solved this problem by producing cathode rays in a better vacuum than had ever been used before. He showed that the failure to produce deflection was caused by the presence of too many gaseous atoms in the cathode tube. By measuring the deflection of the cathode rays by both magnetic and electrical fields, he was also able to determine the charge-to-mass ratio (e/m) for the particles that make up cathode rays. He reported that the value of this ratio was about 1/2000 that of hydrogen atoms, the smallest atoms known. It was obvious, therefore, that the cathode-ray particles were much smaller than an atom; they were the first subatomic particles ever discovered. Later research by Thomson showed that all atoms contain cathode-ray particles with the same e/m ratio. It became obvious that all matter contains such particles, for which Thomson suggested the name corpuscles. That name did not receive general approval, however, and an earlier name suggested by Stoney, electron, was eventually adopted. For his discovery of the electron, Thomson received the 1906 Nobel Prize in physics. Thomson next turned his attention to developing a model of the atom that incorporated his discovery. He suggested that an atom might consist of a sphere of positive electricity in which are embedded electrons. The model became known as the "plum pudding atom" because of its similarity to that English type of pudding. Thomson made original contributions in a number of other fields. 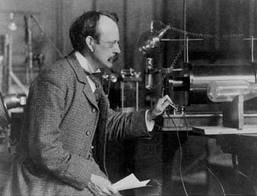 After 1906, for example, he turned his attention to the positively charged channel rays produced in a cathode ray tube. He found that electrical and magnetic fields could separate a stream of channel rays into two or more parts. This discovery set the stage for the invention of the mass spectrograph and the discovery of isotopes by Thomson's student, Francis Aston. Thomson's impact on science has also resulted from the enormous productivity of his students, no fewer than seven of whom went on to earn Nobel Prizes. He made the Cavendish Laboratories at Cambridge a premier center for research in physics between 1894 and 1919. He was succeeded as director of the Cavendish in 1919 by perhaps the most famous of all his students, Ernest Rutherford. Thomson died in Cambridge on August 30, 1940.